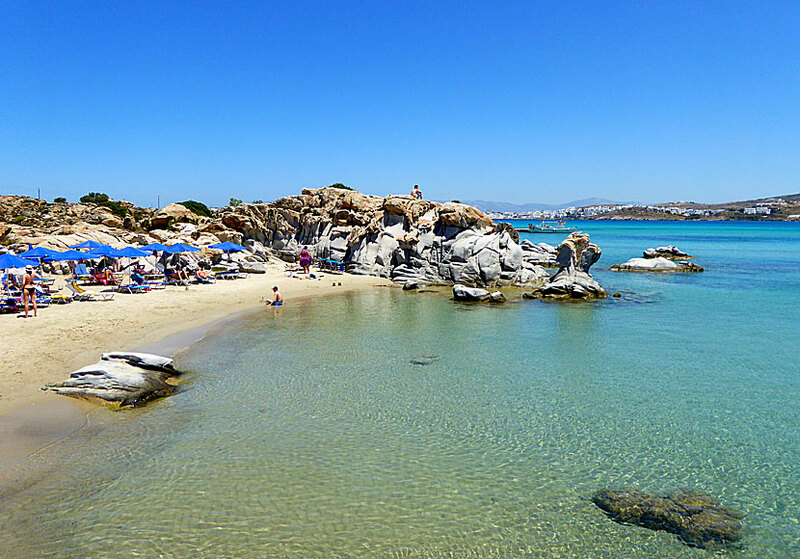 Kolymbithres, opposite Naoussa, is located in a protected lagoon-like bay with crystal clear turquoise waters. 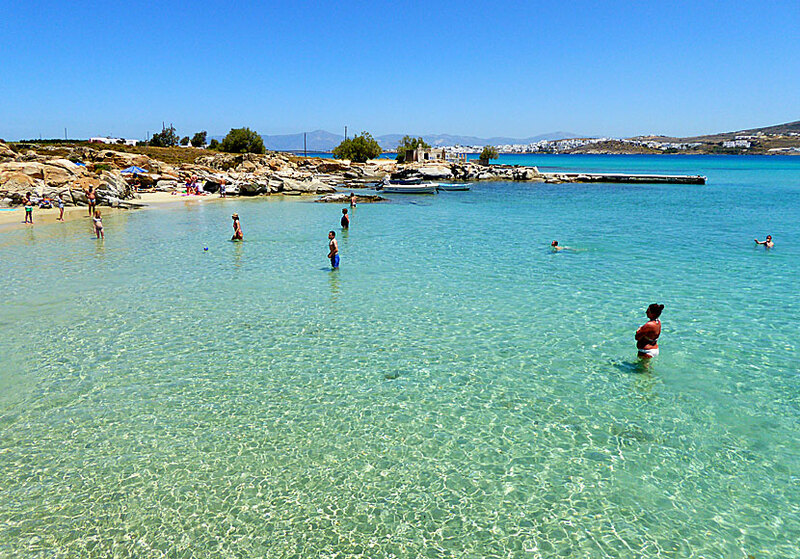 Kolymbithres is one of my absolute favourite beaches, and I think that Kolymbithres is the best beach on Paros. One of several small beaches at Kolymbithres. The reason for my enthusiasm is the strange rock formations surrounding the beaches, they are fascinating to look at and they are wonderful to lie on. The rocks are connected by small sandy coves with fine golden sand. The bay resembles of a swimming pool and do indeed tempts for swimming. The nice sandy bottom extends far out from the shore, it is shallow and child-friendly. 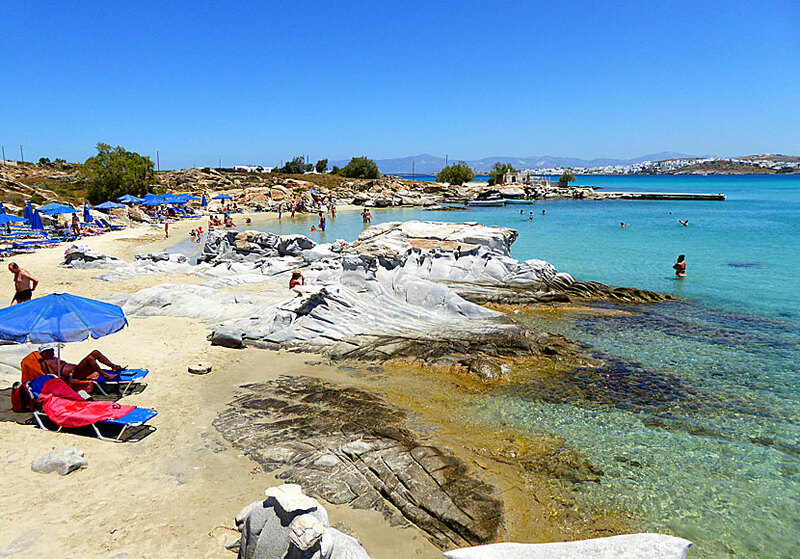 Kolymbithres beach with its unique rocks. With snorkel and mask, you can explore the little animal life that is around the rocks, there are sea cucumbers, fishes that looks like aquarium fishes and quite a considerable amount of shells, both populated and abandoned. Above the beach is a couple of nice tavernas, the best is in my opinion Taverna Vigla from where you have great views overlooking the sea all the way towards Naoussa. Kolymbithres is reach with your own transport or by beach boat from Naoussa's fishing port. If you go by beach boat from Naoussa (as you see in the background) you will pass the island of Agia Kali, in the centre of the island is a chapel called Analipsi. When the Russians occupied Paros between 1770 and 1777, they used the small island as headquarters. Do not miss Monastiri beach which is close to Kolymbithres.